Pizza night is a regular occurrence in this household. We love our pizza. All variations. 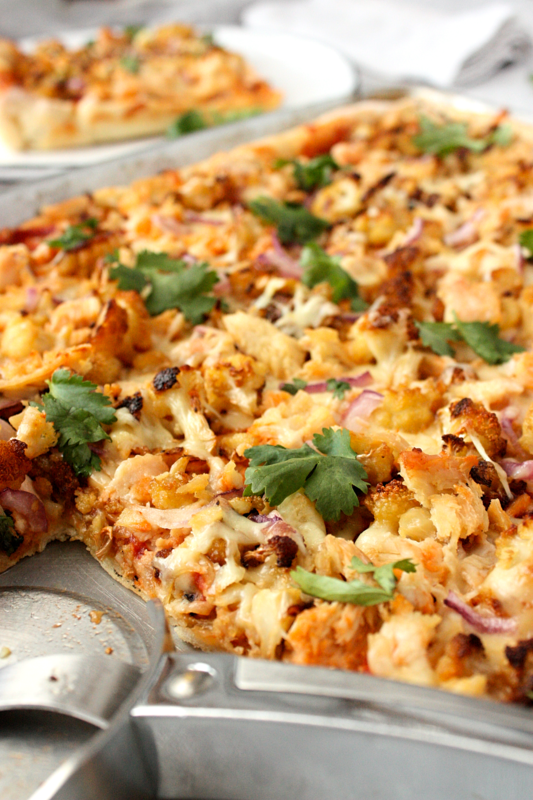 Especially this roasted cauliflower chicken pizza. 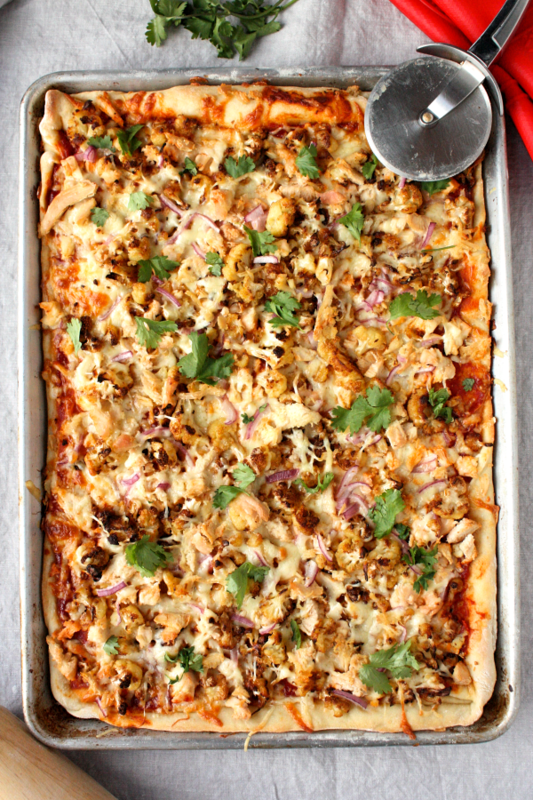 If you’re a roasted cauliflower fan like me, you’ll love this pizza, which is loaded with cauliflower and lots of other really good stuff, like roasted chicken, a tangy tomato sauce, cilantro and red onions. Pizza wasn’t always a regular go-to-meal, for a few reasons. I never used to make the crust and sauce from scratch, so unless I had planned ahead of time to pick up prepared pizza crusts from the grocery store, it wasn’t an easy-don’t-want-to-leave-the-house-kind-of-meal. This all changed, when it finally dawned on me to just make my own crust. Third-world revelations, folks. I think I resisted for so long, because I had some notion that making pizza crust was this long arduous process. Surprise, it’s not. Joke’s on me. And homemade sauce, well, it’s just as simple. My pantry was already stocked with everything I needed. While you might not need to run out to pick up pizza crusts (hooray! ), you do need to factor in a little time to let the dough rise. But the major pro here is you can stay in pjamas (if that’s the kind of day you’re having). My go-to pizza crust recipe is from Ricardo, and it all comes together very quickly. Ricardo recommends using a food processor, but I find it just as easy to use a mixing bowl, wooden spoon, and my hands. See the picture above on the far left to see how it looks after rising for 30 minutes. Since we eat a lot of pizza, I’m always thinking about how to change it up from our regular margherita or pepperoni pizza, which the kids love, and how to get in more veggies. And since the whole family loves roasted cauliflower, this pairing, with chicken and tangy tomato sauce, was a hit. SO. DARN. GOOD. Worth the rising and the roasting. Look at all those glorious little morsels of roasted, cheesy goodness. What’s your favourite pizza recipe? Let me know in the comments below! 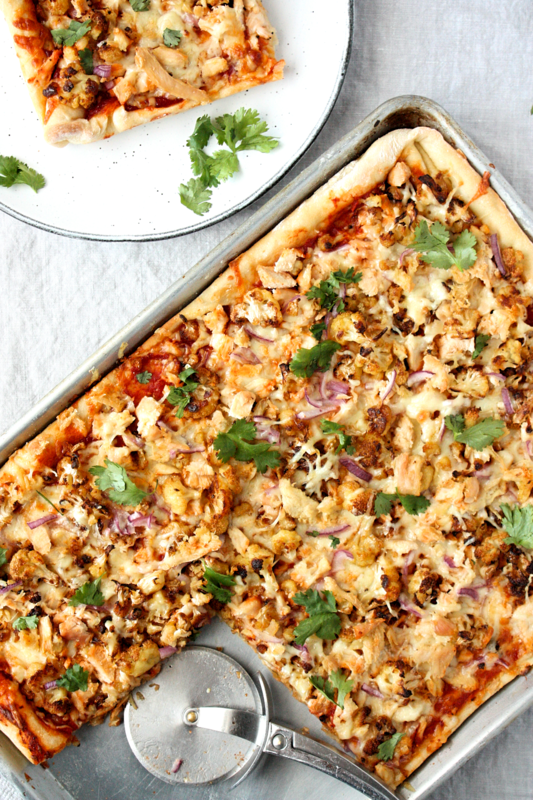 Begin by preparing your dough, roasted cauliflower and chicken. They all take roughly the same amount of time. 30-40 minutes. As a time-saver, you can prepare all the night before and have them ready to go in the refrigerator. Preheat your oven to 400 degrees. Line two sheet pans with parchment paper (one large for the cauliflower, one small for the chicken breasts). 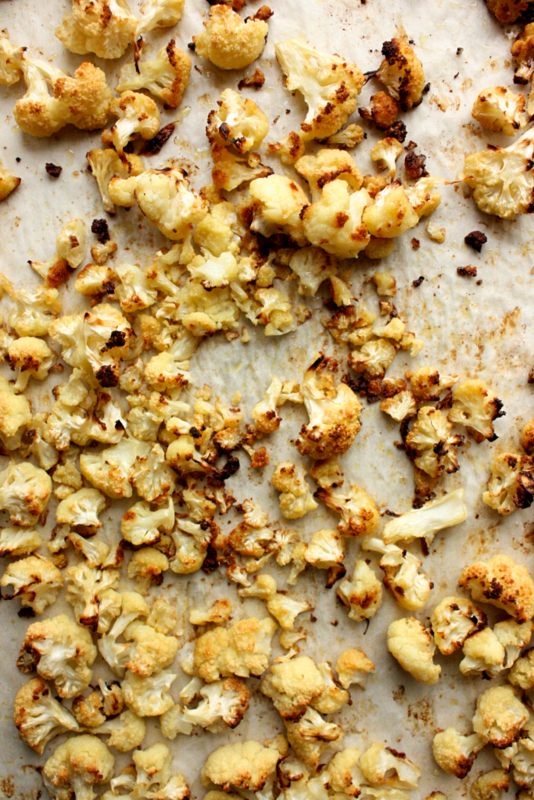 Wash cauliflower, remove stems and chop into small florets. Toss onto large baking sheet and drizzle with olive oil. Sprinkle with kosher salt and fresh pepper—be generous. With your hands toss around until all the florets are nicely coated. Roast in the oven for 30-45 minutes (taking out to stir after 20 minutes), until tender and browning. Similarly, place chicken breasts on the small baking sheet, drizzle with olive oil and sprinkle with salt and pepper. Place in the oven alongside the cauliflower to roast. They should be fully cooked in 25-35 minutes, depending on their size, and other variables. Once both are roasted, set aside for pizza assembly. Once the cauliflower and chicken are in the oven, prepare the dough. In a large mixing bowl, whisk flour and salt. In a small bowl, stir together warm water, yeast and sugar. Let sit for 5 minutes—the yeast should bloom. Add water mixture slowly to the flour stirring with a wooden spoon until a dough begins to form. At this point, tip the dough onto a lightly floured surface and knead until a smooth ball is formed. You'll need to sprinkle in extra flour to reach the perfect consistency (this usually amounts to an extra 1/4 cup of flour). NOTE: The dough should feel smooth, be easy to handle, no longer sticky and not dry. Place in a well-oiled bowl, cover with a clean tea towel and place somewhere warm to rise for at least 30 minutes. I stick my dough in the microwave with a mug of boiling water. With the chicken and cauliflower roasting, and the dough rising, prep your fixings. In a small stovetop pot over medium heat, whisk together tomato paste, water, cider, sugar, salt and garlic. Bring to boil and let simmer for 5 minutes. Set aside. 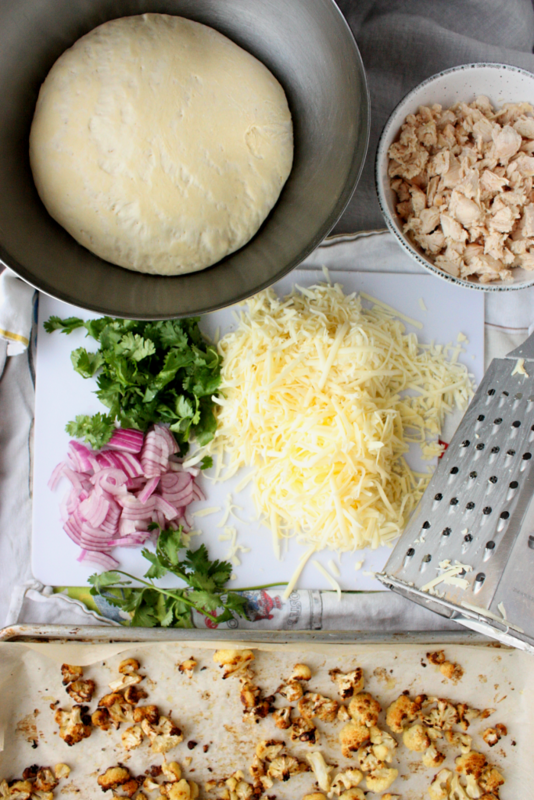 Grate mozzarella and cheddar, set aside. Roughly chop red onion and set aside. Wash cilantro, remove leaves from stems and set aside for serving. It's all ready to come together. Preheat your oven to 425 degrees. Tip dough onto floured surface and roll out into a large rectangle, the size of your baking sheet. Carefully transfer the rolled out dough onto the well greased baking sheet. DO NOT forget to grease your baking sheet with olive oil. 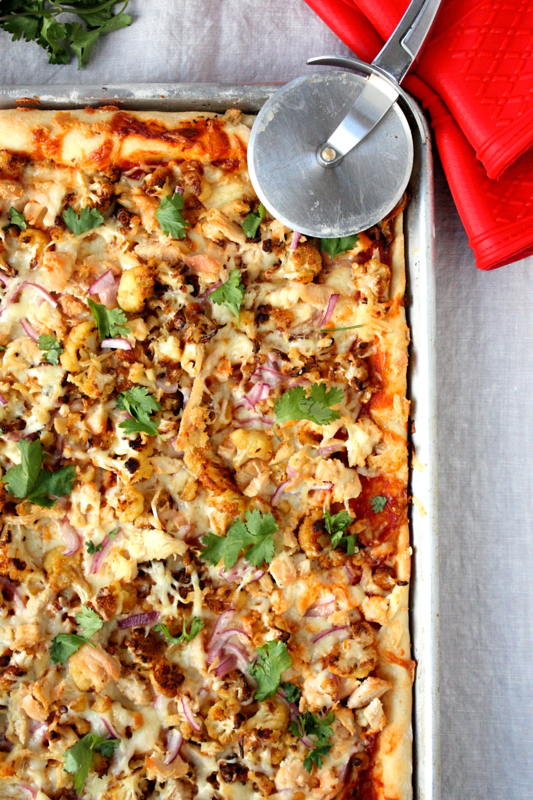 There's nothing worse than a pizza that you can't get off the baking sheet (especially when you're hungry). Evenly spread the pizza sauce over the dough. I use all of the prepared sauce, but if you prefer a less saucy pizza, adjust to your taste. Top with two thirds the roasted cauliflower and chicken, followed by the cheese. 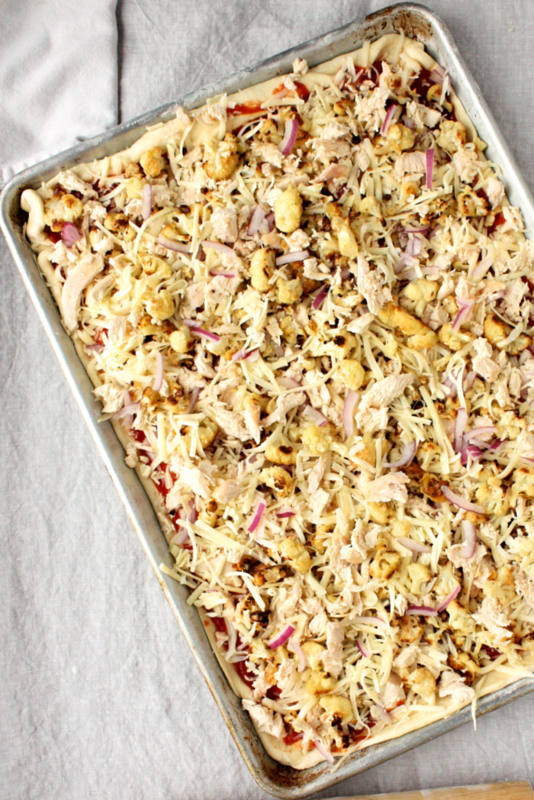 Sprinkle the remaining cauliflower and chicken over top the cheese, along with the red onion. Bake for 20 minutes, or until the crust appears golden and cooked through. Enjoy!